Since we had plans for New Years, I left the buckets of frozen must in the shed in the yard for 2 days to keep them frozen until after New Years Day. (The temp outside was 14 degrees F). I started thawing them in the evening of Jan 1. I brought them into the kitchen and placed them on top of a vent on the floor with an electric blanket around them set to low, since the room temp is only about 65 degrees. 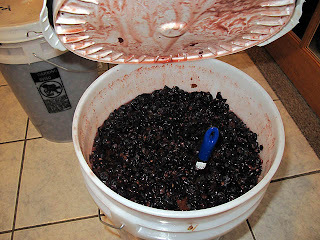 About 36 hours later, they had reached 75 degrees and time to start fermenting. Since I want to do my winemaking in the cellar, which is currently 57 degrees, I had to come up with a way to heat the fermentor. Again, the electric blanket enters the picture. I bought a cheap electric blanket at Amazon for $27. It has 8 power settings so I can fine tune the temperature of the must. 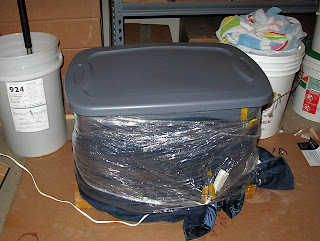 So in preparation for the fermentation, I washed and disinfected the tote which will serve as my primary fermentor, took it to the cellar and wrapped the electric blanket around it. Then I wrapped the whole thing in plastic sheet to help hold the blanket (and also to keep the heat in and make the blanket a little more efficient). I started the yeast culture by adding it to small amount of warm water, stirring it in and giving it 20 minutes or so to start foaming. It smelled just like bread yeast. The yeast I chose is RC212--a strain that is good for pinot noir, as it is a yeast derived from natural ones used in Burgundy. It was recommended to me by Brehm Vineyards. While the yeast was "brewing," I dumped the 2 large buckets of must into the fermentor and washed out the buckets (I'm sure they will come in handy for something). Then the yeast went in. I followed the instructions and did not stir the yeast in, but simply dumped it on top. I put the lid on the fermentor and that was it. 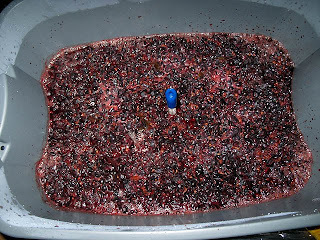 I took a few measurements and got 26 Brix. Now, several hours after innoculating the must, the cellar smells of yeast and fermenting grapes and a few bubbles are forming on the top of the must. More information and pictures to follow!